It's been two years in the making, but the series 17 episodic releases have finally come to a close in the UK with the release of Railway Mischief! So... where do I start with this? Well, I'm really glad that all 26 episodes have been released on episodic releases; it means we in the UK don't have to rely on the complete series releases to get all the episodes on discs. Yeah, it's about four times more expensive than getting the complete release, but still. Second, it feels really weird that the first series 17 release in America was the last one released here. I'm not sure why that happened, but... better late than never? Maybe? And finally, the episodes on this release are a pretty mixed bag. Watching them back for the purposes of this review, it was actually fascinating how far the series has come now. And this was from a two year old series! 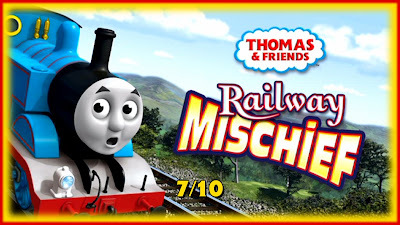 That said, my opinions on the episodes haven't changed: Bill or Ben?, Gordon Runs Dry and Kevin's Cranky Friend were good, Scruff's Makeover and Wayward Winston were OK and the final two episodes were bad (Steamie Stafford was the worst of this era, and here's hoping that, with the current improvements, it stays that way). The segments here were nothing new, apart from the subject matter. Mr Perkins' Postcard focused on Brendam Docks. Even though he mentioned there were a lot of ports on the island, the only one referenced was Brendam since, when it was made, it was the only port to be seen in the CG era. But since Arlesburgh Harbour will be featured in Sodor's Legend of the Lost Treasure and there was, like I said, mention of many ports on Sodor, that may soon change (hopefully). The Story Time segment featured Thomas' Train, which may be a subtle advertisement for The Adventure Begins before its release next month (on a slight tangent, I've another blog post on that before its release, so keep your eyes peeled). I really enjoyed seeing Loraine Marshall's illustrations for this story. I'd go as far to say these were some of her best as they fit extremely well. I also liked her homage to the illustration from Thomas and the Trucks, which was used as the front cover image for Thomas the Tank Engine. I said in an earlier DVD review (Trouble on the Tracks) that her illustrations felt "out of place" in Toby's Tightrope because her style is different to Gunvor and Peter Edwards'. But it feels like hers and C. Reginald Dalby's are pretty similar: bright, eye catching and colourful, so they blend together a lot better. And now we come to Henry being green. Everyone's shocked by this, but I'm more shocked by the old shape! In all seriousness though, I really don't care. He was never painted blue on TV and he was only blue between the final illustration of The Three Railway Engines to Troublesome Engines, where the foreword stated he'd been painted green again (because of how confused the artists were trying to differentiate between him and Gordon). Besides, this isn't the first time engines have been altered from the books in illustrations. That said, it was weird to see him green in the wide shot and blue in the close up of Thomas. Maybe Loraine was as confused as the others? Or maybe she forgot? We'll probably never know. Who's That Engine? featured Edward this time around, and Arc did a great job showing him off (although I may be biased since he's my favourite character). It's a bit of a shame they used his series 18 render (notice his hand rails are black, not silver), but at least it has the head and tail lamps, so it's not too bad. The story shown off was Edward the Hero which, while nothing too special, was one of the few episodes from the Barlow era to get his character right (at least, from the halfway point onwards). There were four Really Useful Engines segments featured: Stafford, Spencer, Hiro and Flynn. While the final two were good and described the characters well, the first two intrigued me the most. Stafford's since they put great emphasis on him being a shunter (which I'm grateful for), but because it it felt really weird knowing they put it on the exact same release where he was the main focus of a story which had nothing to do with him being a shunter. Spencer's, on the other hand, intrigued me because of the word choices used. I don't think we've heard him be called a "snob" before, but it was really amusing and fitting. But the one that got me was them mentioning he pulled Pullman coaches. While I'm glad of the reference and I can understand why they called them that (the style is there), they just don't have the look of Pullmans overall, but I may do a blog post of that in the future. The Earl's Quiz was pretty standard, with questions this time on Scruff's Makeover and Luke's New Friend. It's nice that the questions are getting slightly tougher and the episodes more recent, but they're still relatively simple for some kids. Then again, they could be difficult for others. Regardless though, they're a good teaching tool, so no qualms from me. At the start of the DVD was, again, the trailer for Sodor's Legend of the Lost Treasure, coming to cinemas nationwide from July 17th for two weeks and DVD (in the UK) September 28th. And there'll be performances at Cadogan Hall in London on the 26th and 27th of August. Oh, and there's an advert for Thomas Land, which doesn't seem to have been updated to include the newest attractions. The presentation is the standard fare for Thomas and Friends; high quality animation and a crisp, widescreen picture. 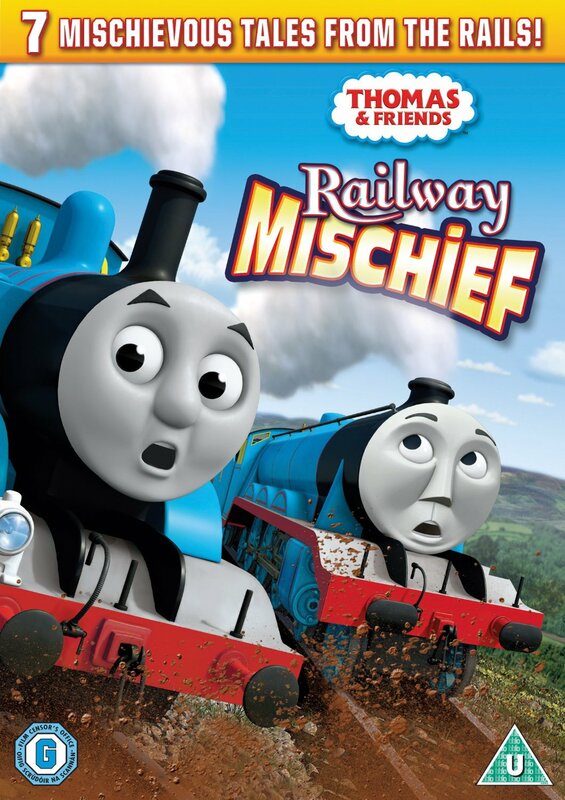 Like I said, this was featuring the first episodes of Arc Productions' tenure, so compared to Trouble on the Tracks or Dinos and Discoveries, some may say it's not as good, but it was still an excellent starting point on which to build. I'll be honest: this is probably the toughest DVD I've had to rate. Like I said at the start, it took two years for this to get here! Personally, I'm not too bothered as the episodes aired here shortly after this was released in the US, and the British version does have a few differences from the version across the pond. But will parents in the know really be happy with being snuffed like this for so long? The big question is: would I recommend it? Well, yes and no. If you're still one for collecting DVDs, then you should get it for the cheapest price you can. However, if you're more into the digital age - and don't care about missing out on the bonus features - Channel 5's website streams every episode from series 8-18 for free.